Do you own a business, blog or provide other services related to the vintage/retro community? Here's your chance to tell the world about it and advertise on Va-Voom Vintage!In light of many recent advertising requests from various businesses, I am opening Va-Voom Vintage to sponsorship. Va-Voom Vintage receives an average of 6,000 visits per month with over 370 dedicated readers worldwide. 59% of my readers are in the US and 13% are in the UK. 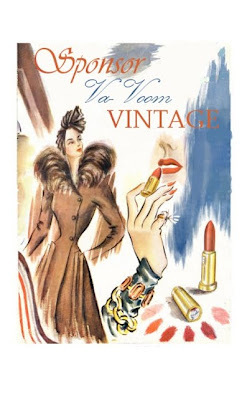 With links on many other blogs, websites and vintage networking sites, Va-Voom Vintage readership grows more every day! Sponsors will receive an ad space of 150 x 150 pixels. Ads are placed in the left hand column, at the top of the page. The minimum time frame for sponsorship is one month. Advertisements may be purchased on a month-to-month basis or longer if desired. I will write a blog post about each sponsor, sharing photos, reviews and talking about the wonderful products and services you have to offer. For this reason, I will only accept sponsorship from businesses that pertain to my blog's contents and whose products I do or would use. I spend a great deal of time making sure that my blog is interesting for my readers and has valid content, so I have to stay true to that goal. ♥ Retro or vintage-inspired handmade goods and crafts. In the past, I have modeled products, provided reviews and hosted giveaways for business owners on Va-Voom Vintage. If you would like to collaborate on any extras, please contact me at the email address listed below!